Appendicitis patients present at varying stages of the disease process. Sometimes they come the very day that pain begins. Other times, they wait until the pain has been present for over a week and they just can’t stand it anymore. One young man came to the hospital with a week of pain in the right side of the abdomen and a fullness on the same side. 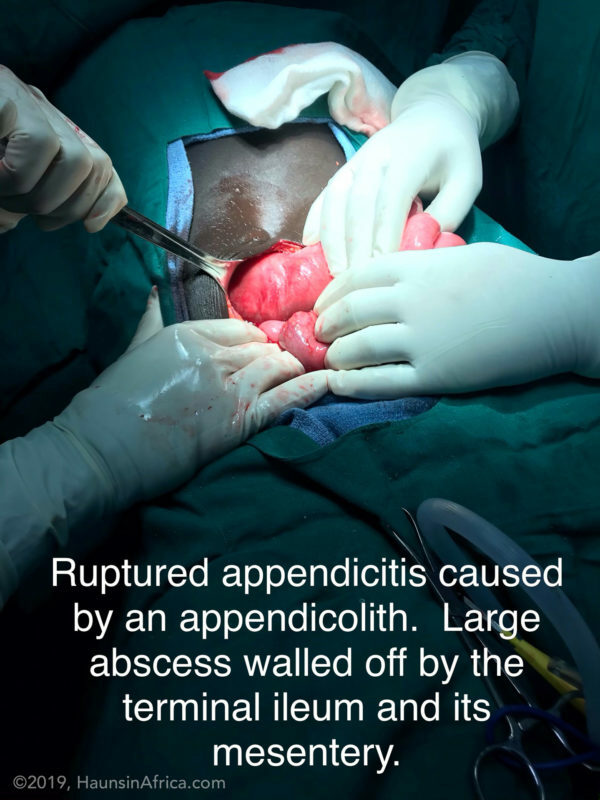 His story and exam were consistent with appendicitis that had perforated and created an abscess. 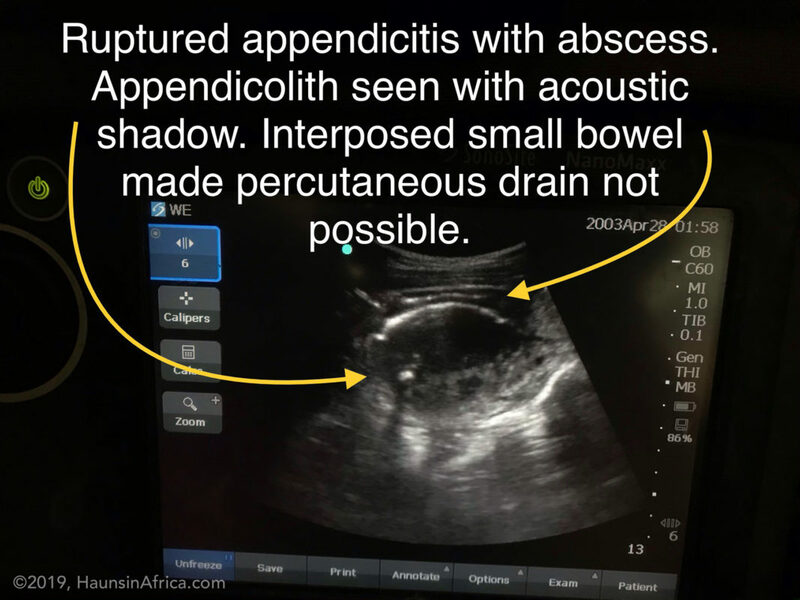 On ultrasound, we saw a large abscess with what appeared to be a small stone (appendicolith – the offending agent that blocked the appendix and caused the appendicitis). Often, when an abscess forms after appendicitis, it forms just under the skin and muscle. If it is superficial, we are able to make a small incision to enter the abscess cavity and drain it without having to do a large operation. This time, however, I noticed that there was something interposed between the abdominal wall and the abscess. He needed a big operation! 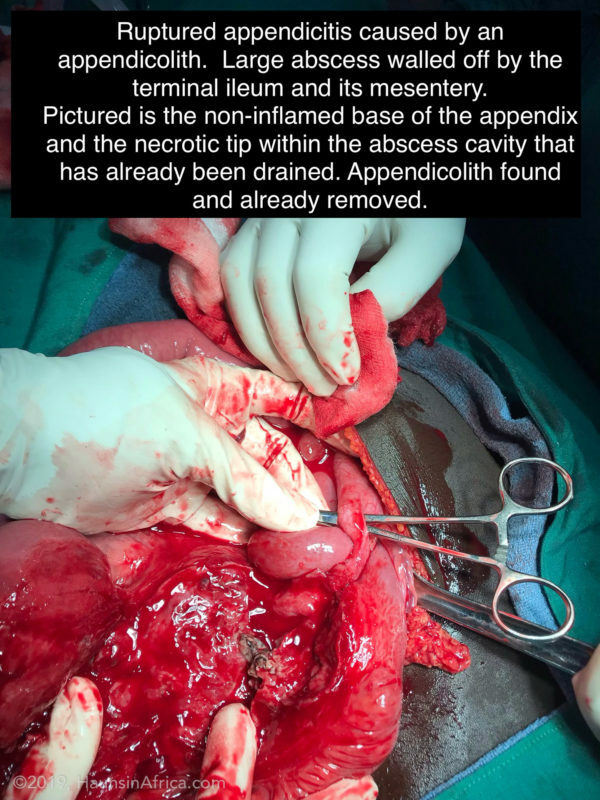 In the operating room, we found that his intestines and the mesentery (the tissue containing the blood supply to the bowels) had wrapped itself around the abscess to keep the infection from spreading to his entire abdomen. I was able to drain the abscess and remove the appendix without injuring the bowel. The patient recovered very well. In these situations, I am amazed once again at how our creator designed the human body to protect itself from infection spreading throughout the abdomen. Sure, it doesn’t always work that way, but nonetheless, the human body is such an incredible creation.